Nitrogen is a critical nutrient for the growth of photosynthetic microscopic marine organisms known as phytoplankton. Just like you and I need a proper balance of vitamins and minerals in our diet, these microscopic organisms need a proper diet of vitamins to grow and survive. In a normal boom-and-bust life cycle of plankton, growth is limited because there is a small amount of naturally-occurring nitrogen in the water. This makes nitrogen a “limiting factor” for the growth of phytoplankton. Since phytoplankton form the base of the marine food web in many systems, the timing and magnitude of their growth cycles can determine the success of other animals higher up the food chain, like clams, mussels, crabs, and fish. The limitation on phytoplankton growth in coastal waters has been removed, however, in large part due to human activities. Large-scale agriculture, common lawn fertilizers, wastewater treatment, and increased urban development have all contributed to increased nitrogen loads to watersheds and downstream coastal habitats. Increased nitrogen inputs might be seasonal in some places, when seasonal heavy rains, storms, or floods wash excess nutrients into the watershed and surrounding coastal areas. This increase in nitrogen and other nutrients is called “eutrophication” and it can lead to large “blooms” of phytoplankton growth and dramatic changes in coastal environments. At first you might think that more plankton, at the base of the food chain, would be a great benefit for the animals further up the food chain. But the reality is that an increase in phytoplankton means an increase in phytoplankton death. When phytoplankton die, they are decomposed by bacteria, a process which requires oxygen. If there are especially large amounts of phytoplankton, bacteria can use large amounts of oxygen during decomposition, which causes “hypoxia” (low oxygen) and sometimes “anoxia” (no oxygen at all). Some animals, like fish, can move out of these hypoxic or anoxic zones, but many cannot. Critters that live in or on the ocean floor (like tubeworms, clams, seastars, and crabs) might not be able to move away quickly enough or at all, and die because the oxygen is too low to survive. In some cases, the excess nitrogen loads are so large that huge “dead zones” form. This can be seen every year near the mouth of the Mississippi River, in what has come to be known as the Gulf of Mexico Dead Zone. In 2017, this dead zone was the largest on record — about the size of the state of New Jersey at just over 8,770 miles. 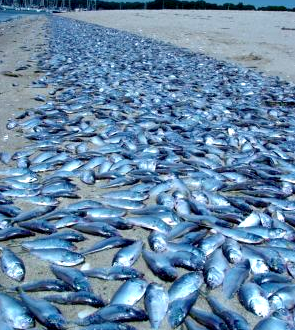 These large-scale dead zones often kill thousands or tens of thousands of fish, which can be found washed up on beaches. Eutrophication can also lead to red tide blooms. A “red tide” is made up of microscopic planktonic organisms called dinoflagellates. Red tide organisms produce a toxin that can kill fish and shellfish and even larger marine mammals like dolphins and manatees. If you eat shellfish that has been exposed to red tide toxin, you can experience symptoms ranging from short term memory loss to brain damage and even death in severe cases. The toxin can also cause breathing problems and respiratory irritation in humans who are nearby a bloom. I experienced this first hand last October, during the last big red tide bloom off the coast of Treasure Island here in Florida. As you might imagine, all of this is bad news for tourism, beach goers, and recreational and commercial fishermen. So what can you do to help prevent eutrophication effects on important coastal ecosystems? Know when and how to apply fertilizer for your climate. Not all lawns and not all climates are created equal! Learn what time of year to apply fertilizer (when the potential for run-off into coastal watersheds is lowest), and how much to use (to avoid unnecessary excess nitrogen loads into your local waterways). Consider switching your lawn or gardening to a native landscape appropriate for the local climate. Fertilizer is often unnecessary if you use native plants and landscaping that can withstand natural climate fluctuations throughout the year. Native landscaping usually requires less irrigation as well, reducing your overall water usage and potential for nitrogen and nutrient run-off. Support local farmers and ranchers that are dedicated to environmentally-friendly agricultural practices. Factory-scale farming is one of the largest producers of excess nitrogen into our nation’s waterways. Opt instead for small-scale local producers. They are much less likely to contribute large nitrogen loads to our waterways and coasts. Adopt a more plant-based diet. Excess nitrogen loading from farming is especially apparent in cattle, hog, and chicken farming. Incorporating more produce or adopting a vegetarian-style diet is a small but significant personal choice that can help curtail the negative effects of agriculture on coastal ecosystems. Spread the word! Let your friends and family know how their choices can help prevent eutrophication and protect important watershed and coastal environments.